This policy was originally created in June 2009 for the Quality Management System and will continue to be valid in this format and the manual. GULF E&C is a Construction & Maintenance Company carrying out plant construction, maintenance, and manpower services, in the field of mechanical, electrical, civil, HVAC and environmental services. The Company is committed to providing a quality service to its Clients which accurately interprets their requirements and satisfies their expectations in an innovative, economic and efficient manner. GULF E&C will achieve these aims through the operation of a Quality Management System. This addresses the following key issues developed in accordance with ISO 9001:2008 to which the Company is under registration process. This policy and its aims are communicated and understood throughout the Company as necessary and are reviewed to ensure continually improving performance. We believe that every accident is preventable. We not only incorporate ―best practices‖ into our safety culture, we create them. 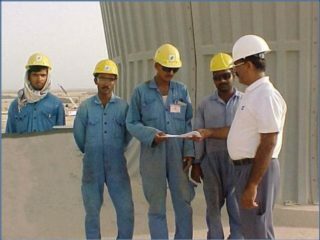 Each one of our employees shares an obligation to prevent accidents and is expected to conduct work in a way that actively integrates the elements of GULF E&C Health, Safety and Environment Program into applicable aspects of operations. Immersion in our safety culture begins on the first day of employment—from ergonomics to regulatory-compliant training, from case studies to on-site assessments. Our commitment to safety has garnered recognition from clients, community and regulators. Training is an essential element of HSE excellence and it is also considered to be as essential element to assist with our target to ZERO accident, nil property damage and least minimum impairment to the environments. 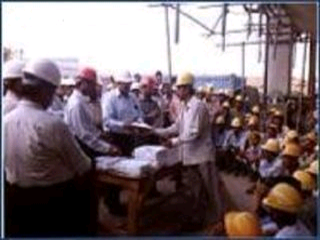 GULF E&C has an established HSE Training Centre with a capacity to accommodate 35 participants with training aids for imparting in-house HSE training on various subjects to our employees at different levels. GULF E&C has won safety awards and appreciations for outstanding Safety Performance on the job. Fabrication, Erection, Welding, installation And Commissioning of Diesel Max area. GULF E&C received the Safety Performance Award from Marubeni Corporation (Japan). GULF E&C received the Safety Performance Award from ESB International on the achievement of 400 consecutive days with no LTI. 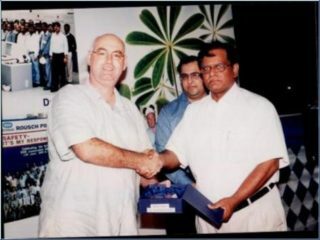 GULF E&C received the Safety Performance Award from ESB International on the achievement of 1,000 consecutive days with no LTI (29 June 2001 to 24 March 2004).